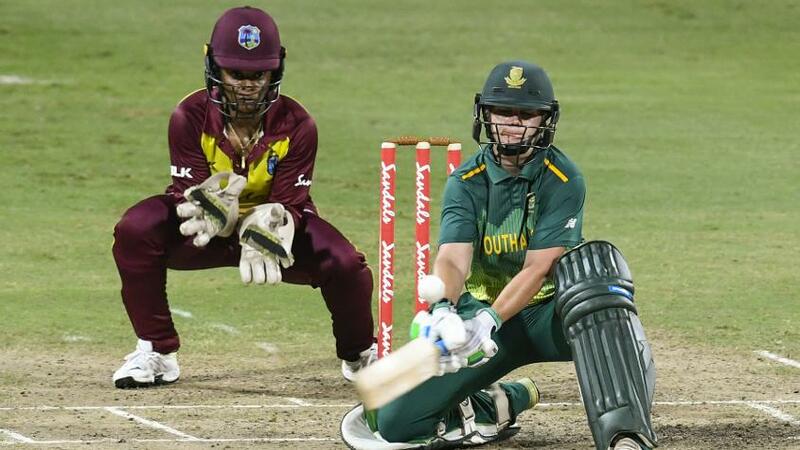 Hayley Matthews scored her maiden one-day international century as the Windies eased past South Africa by 115 runs in their final ICC Women’s Championship game. The result, in Barbados on Saturday, 22 September, helped the Windies square the series 1-1 – the second game was abandoned because of rain – and gain valuable points on the championship table. Matthews’ 146-ball 117, along with Stafanie Taylor’s 80-ball 46 and Deandra Dottin’s aggressive 44-ball 59, helped the Windies post a mammoth 292/5 despite Marizanne Kapp returning 4/55. Dane van Niekerk, the South Africa captain, then scored a 105-ball 77, putting on 108 with Laura Wolvaardt (54 off 82). However, with the rest of the batters struggling, South Africa only managed 177, Dottin returning 4/36. The Windies didn’t have the greatest start, with Kycia Knight dismissed for 5 by Kapp in just the third over after Taylor had opted to bat. Unfortunately for South Africa, they couldn’t really capitalise on the opening. Matthews and Taylor added 176 for the second wicket, and it was only in the 37th over that the visitors had anything to cheer about, when Taylor became Kapp’s second wicket. Matthews didn’t last long after that, with Tumi Sekhukhune, the medium pacer, dismissing her and the Windies were 215/3. Shemaine Campbelle (14) lasted just 12 balls before falling to Kapp, but in came Dottin to power the Windies to a big total. Her 44-ball knock comprised four fours and three sixes, and by the time she was dismissed, in the penultimate over, the damage had already been done. South Africa got their chase off to a terrible start – they were reduced to 10/2 within five overs, with Lizelle Lee and Sune Luus unable to make a mark. Van Niekerk and Wolvaardt then kept South Africa’s hopes alive, pushing the visitors' total past the 100-run mark. The chase seemed on track, but when Afy Fletcher had Wolvaardt dismissed in the 30th over, the visitors imploded. No batter reached double figures thereafter, and when van Niekerk was run out for 77 in the 41st over, the Windies’ win was all but sealed. The teams will now play five Twenty20 Internationals, the first of which will be played in Bridgetown on Monday.